Family biking is an ideal way to spend quality time together. Virginia offers a vast array of family biking venues that take you through deep forests, among the mountains, along the shore and through the city. What fun it is to cruise a friendly pathway or rail trail on your bike, family in tow! Revel in the breeze while pedaling your way through resplendent Virginia scenery. After your adventure, gather the crew for a meal or perhaps visit some other nearby attractions, making the most of your family time. 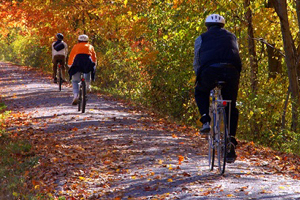 Read on then make plans for your Virginia family biking adventure. 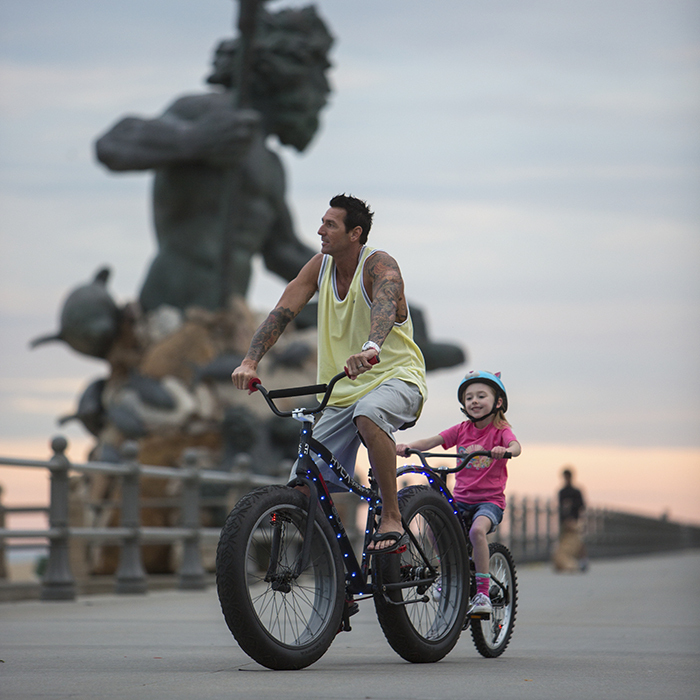 The Ride: The Virginia Beach Boardwalk is a 3-mile long one-way path that runs astride the shoreline of vibrant Virginia Beach. The main path is 28 feet wide to accommodate crowds but the boardwalk has a separate parallel path for bicyclers. It’s fun to cruise the margin dividing sand and sea from the hotels, restaurants and action that is Virginia Beach. You’ve got to get your picture taken in front of the 24-foot high statue of Neptune. Check out the other nautical sculptures. Not only are bike rentals offered but you can actually join guided bike tour of the boardwalk and adjacent areas. After the Ride: Check out the Virginia Beach Surf & Rescue Museum. Cast a line at the Virginia Beach fishing pier. Head to Atlantic Fun Park for Go-kart rides and more. Engage in some oceanfront dining at Johnny Mañana’s Boardwalk Cafe and Tequileria. The Ride: The Tobacco Heritage Trail is a converted rail trail stretching east-west through small towns, serene farms and rolling woods. 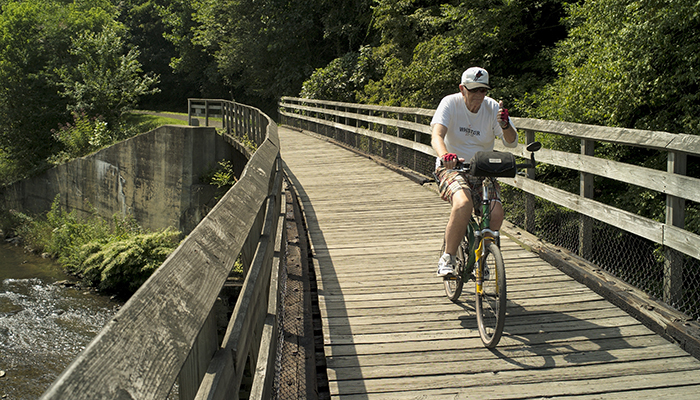 Slated to stretch over 40 miles between Chase City and Lawrenceville, the ever-expanding path has some excellent completed segments for you to enjoy. Start your adventure at the large parking area in La Crosse, located just off I-85, then head east on the rail trail into woods and farms. Roll into Brodnax after 4 miles. From there you can backtrack or continue through the small town. Beyond Brodnax, the trail travels 8 miles through lush woods along Evans Creek to the hamlet of Charlie Hope. After the Ride: Hike or see the history at Occoneechee State Park. Camp at North Bend Campground on Lake Kerr Reservoir, aka Buggs Island Lake. Devour some home style eats at The Hungry Farmer or the Horseshoe Restaurant in South Hill. The Ride: This 6.5-mile one-way gem of a trail was once a spur rail lines linking to a rock quarry. The abandoned track was later converted into the rail trail it is today, and is an under the radar rail trail in Virginia. The path starts near the hamlet of Piney River, at the Piney River Depot. It traverses down the Piney River valley for 4 miles to meet the Tye River. The gravel path then continues for a couple of miles along the Tye to the community of Tye River. Turn around and backtrack. After the Ride: Drive the Blue Ridge Parkway. Hike Mount Pleasant Scenic Area with its fantastic views. 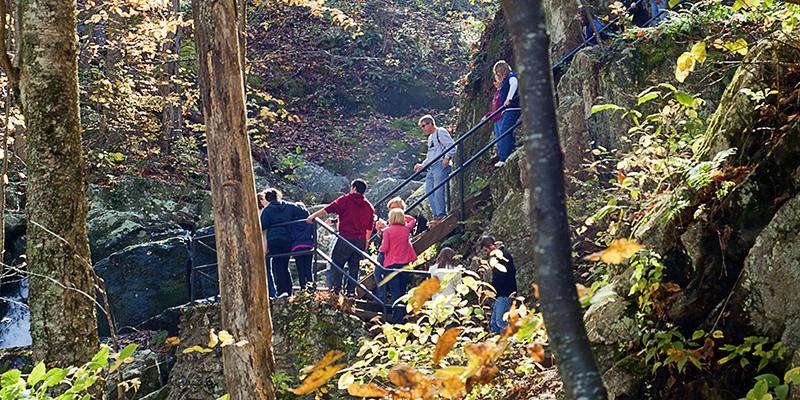 Visit Crabtree Falls. Eat at Ann’s Family Restaurant. Visit James River State Park. The Ride: The paved Riverwalk Trail presents 9 miles of paved pathway on a trail network that continues to grow. 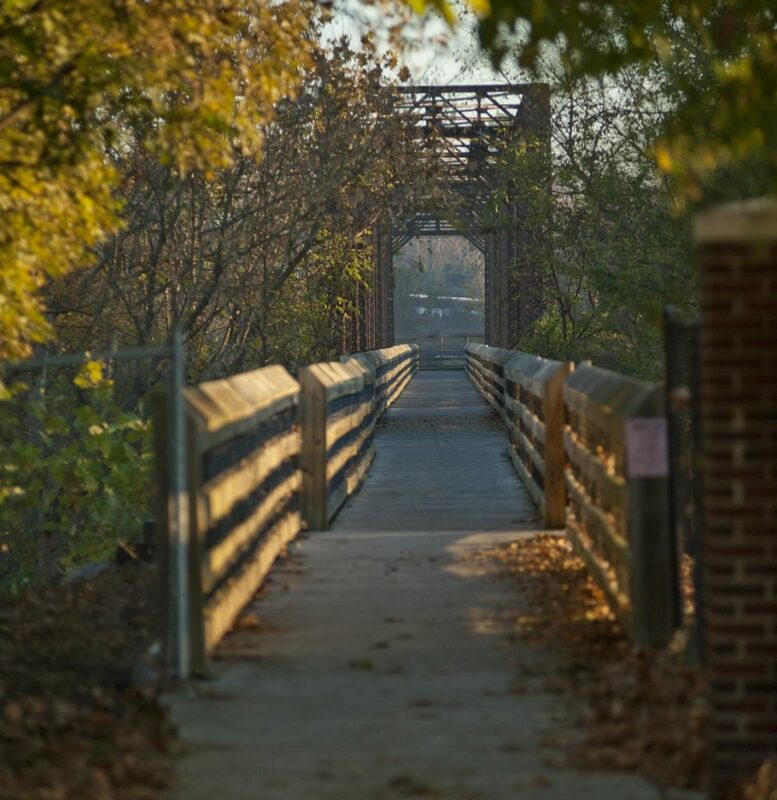 Start out at relaxing Dan Daniel Park, then pick up the paved path running alongside the Dan River in the heart of Danville. You can travel in either direction. Heading northwest, upstream along the Dan, you will pass several bridges crossing the river to downtown. Reach an overlook near the Union Street Bridge after a couple of miles. The trail continues upriver and is being expanded. Leaving the Dan Daniel Park in the other direction, downriver, it is less than two miles to Anglers Park, where a paved track leaves the Dan River north through pleasant woods, intermingled with mountain bike trails. The main Riverwalk continues east beyond along the Dan River, reaching a turnaround. After the Ride: Take the family on a learning mission at the Danville Science Center. Eat at Me’s Burgers & Brews or at the Checkered Pig BBQ and Ribs. Check out the AAF Tank Museum. The Ride: This level and linear trail runs for 8 miles one way along the historic Dismal Swamp Canal. The ride is anything but dismal as you parallel the wildlife-rich canal. 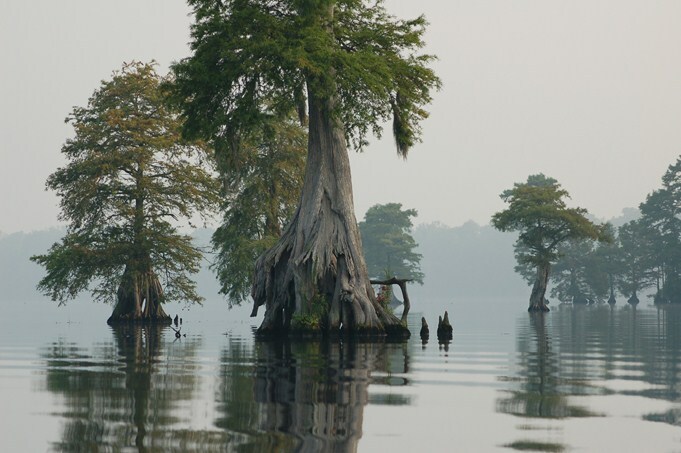 The path – marked every quarter-mile — borders Great Dismal Swamp National Wildlife Refuge. A pair of restrooms are situated along the route. Get a family portrait taken by the statue of “Chessie” the bear at the trailhead. After the Ride: Head to the Chesapeake Arboretum, admission is free. Grab a meal at La Parrilla Mexican Grill. Visit Blackwater Trading Post on Blackwater Creek. Eat some BBQ and check out the general store, perhaps paddle adjacent Blackwater Creek. The Ride: Start at the east end of Wasena Park, where you can rent bikes at nearby Roanoke Mountain Adventures. The Roanoke River Greenways heads west up along the Roanoke River toward Salem. Bridge the Roanoke River 3 times en route to Bridge Street. Heading downriver from Wasena Park, you can pedal until your legs drop, bicycling under Mill Mountain and the Roanoke Star. Continue on to intersect the Tinker Creek Greenway, about 5 miles one way from Wasena Park. The Tinker Creek Greenway ends at Falcon Park. After the Ride: Enjoy the outside seating at the Green Goat eatery. Canoe or kayak the Roanoke River. Soak in the view from the Roanoke Star at mountaintop Mill Mountain Park. Grab a pie at Grace’s Place Pizzeria. The Ride: Draper is conveniently located off I-81 and you can rent bicycles near the trailhead at The Junction, part of Draper Mercantile. The New River Trail stretches 57 miles on a scenic rail corridor, much of it along the New River. I have pedaled this entire path numerous times and proclaim it a Virginia trail treasure. The path is crushed stone. From Draper you can roll southwest to come along the New River after a couple of miles. Pass over a few bridges and trestle. It is 4 miles one way to the Hiwassee Bridge and another 2.5 miles to Allisonia. Heading northeast from Draper you can pedal your way 4 miles to Dora Junction in Pulaski. 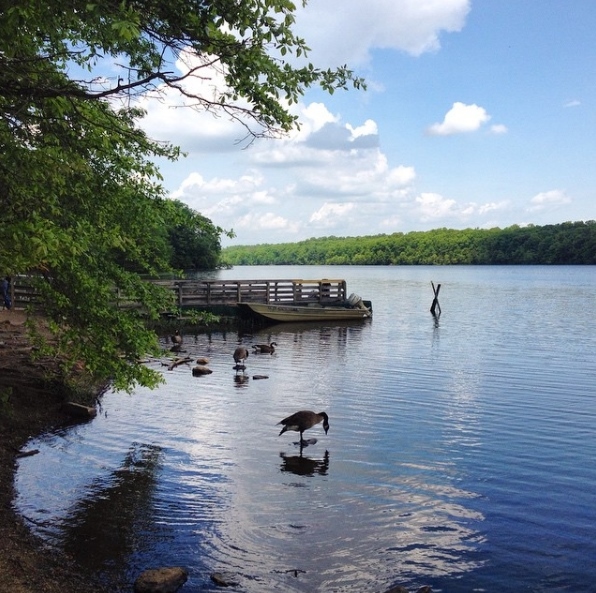 After the Ride: Nearby Claytor Lake State Park features camping, hiking and lake fun. Head over to see the critters at Fort Chiswell Animal Park. Visit and dine at The Mansion at Fort Chiswell. 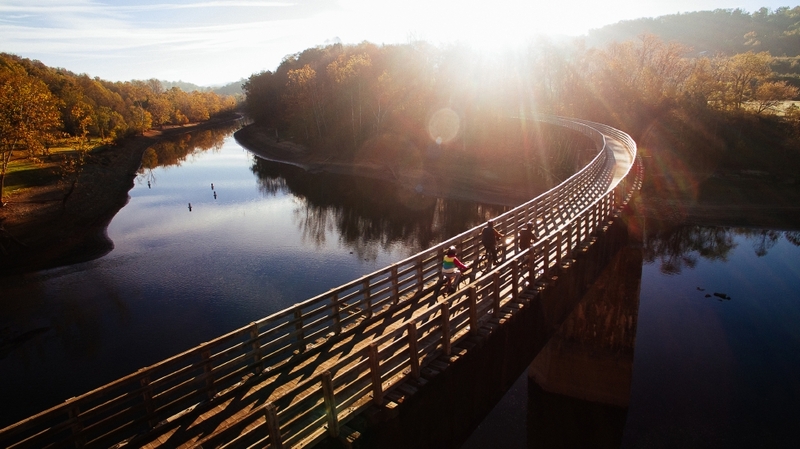 The Ride: Lynchburg’s Riverwalk Trail follows the James River past Percival’s Island Natural Area and downriver for 6 miles in one direction in a decidedly rural experience leading away from Lynchburg. Start your ride on the paved path at Washington and Concord streets, where parking is available and bikes can be rented at Bikes Unlimited. From this trailhead you can also follow the Riverwalk Trail upriver through the heart of Lynchburg then join the paved Blackwater Creek Trail. Pass through the Hollins Mill Tunnel and go 3 miles to end at the Cancer Awareness Garden. Part of the pedal traverses the Blackwater Creek Natural Area. On your return ride down Blackwater Creek use the paved Point of Honor Trail. After the Ride: Visit the Point of Honor 1815 Home. Have a ball at the One Way Out Escape Room. Stop at Amazement Square, an updated educational museum with a climbing tower with slides as well as zip lines. Eat at the Depot Grille on the James River. Have a cone at Ice Cream Dream. 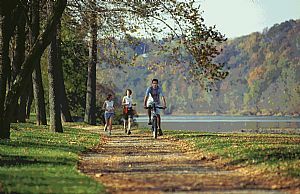 The Ride: Make your nearly 5-mile loop at Burke Lake Park, a fine full facility preserve with a dizzying array of activities in addition to bicycling. Regularly touted as one of the best fitness trails in America, the mostly gravel path circling Burke Lake makes for a fine family bicycle outing. The pathway curves with the curves of the lake, crossing the dam and visiting quiet coves. Additional activities at the park include disc golf, mini-golf, a miniature train, fishing pier, carousel, and ice cream parlor. You can even camp out here and do it all. After the Ride: In addition to the activities on-site at Burke Lake Park, eat a pizza at Coal Fire. Grab a treat at The Swiss Bakery & Pastry Shop. Paddle a canoe or kayak at nearby Fountainhead Regional Park. 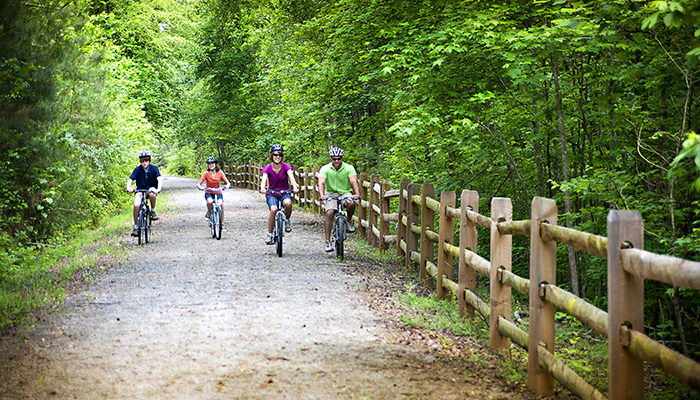 The Ride: You’ll find some of Virginia’s finest family biking on the Creeper Trail. The 34-mile rail trail stretches from Abingdon in the west through Damascus and into the wilds of Mount Rogers National Recreation Area. The stretch from Abingdon morphs from town to deep woods, fields and farms on a dedicated pea gravel track. Cruise over several trestles to finally reach the magnificent trestle over South Holston Lake 8 miles from Abingdon, making for a 16-mile there-and-back ride. After the Ride: Shop at Virginia Creeper Fly Fishing. Stay at the historic Martha Washington Hotel. 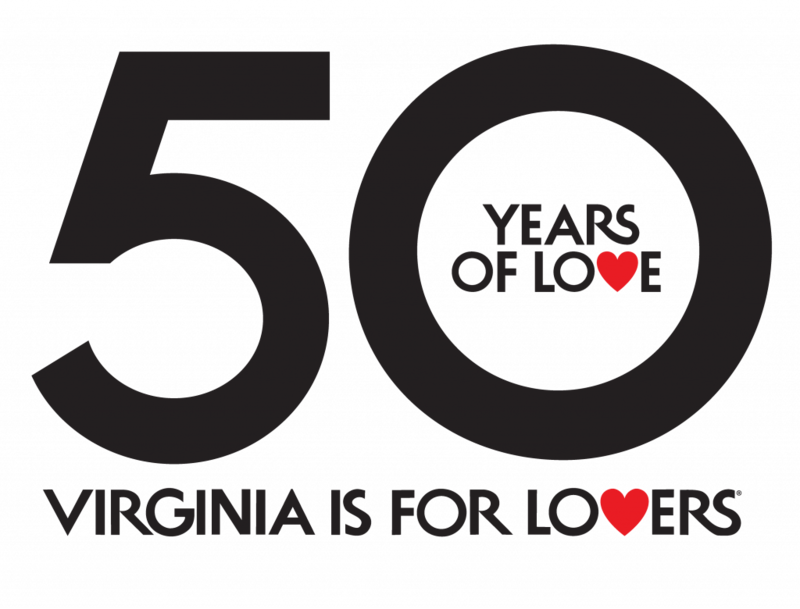 Take in a play at the Barter Theater, the state theater of Virginia. Have a quick bite at Lukes Café. The Ride: Conveniently located off I-64 east of Richmond, York River State Park presents around 20 miles of trail open to bicyclers. Most of the paths are natural surface but don’t let that deter you, since the park trails are generally not steep. Consider starting on the Backbone Trail, a mostly level track that links to other park paths. The Backbone Trail alone makes a 5-mile there and back, but it is easy to increase your mileage. I recommend adding a short loop including the Whitetail Trail and the Dogwood Lane Trail. There are also specific trails dedicated to mountain biking only in addition to the above trails. After the Ride: Paddle the York River. Head to Go-Karts Plus for some racing. Have a burger at Jimmy’s Oven and Grill or some ethnic cuisine at Ballalva’s Mexitalian Restaurant. The Ride: Radford is located on the big and famous New River. Start your ride at Bisset Park, where bikes are available for rent from Tangent Outfitters. Following the trail upriver, you will leave Bisset Park, making your way on the paved path to Veterans Park and Dudley’s Landing, a wildlife viewing area. Trace a bend in the river and this segment ends after 2 miles. Backtrack two miles to Bisset Park then follow the paved path up Connellys Run. The trail tunnels under West Main Street to enter Wildwood Park. Roam through the greenspace bridging Connellys Run and onward to Wadsworth Street for 3 more miles of out and back bicycling. After the Ride: Float down the fabulous New River. See a first-run movie at the vintage Radford Theater. Visit the Glencoe Mansion, Museum and Gallery. Eat a Southern-style meal at the River City Grill. Order a pizza from Benny Nicola’s.